Two weeks between the final warm-up and the start of the tournament could give Cian Healy the window he needs to recover. IRELAND HEAD COACH Joe Schmidt says he would consider selecting Cian Healy in his 31-man Rugby World Cup squad even if the prop did not feature in one of the four Summer Series Tests. However, there is one important caveat for the prop on the road to recovery from neck surgery: the Leinster loosehead must be close to fitness before Ireland face Canada in the opening Pool D match of the tournament on 19 September. “We’re very much working week-to-week with Cian. He’s fully participating in some sessions. He did an individual session today and so he’s mixing that up,” Schmidt said after naming Jack McGrath and Dave Kilcoyne as his matchday looseheads for Saturday’s season-opener away to Wales. “We’re just hoping the picture gets clearer as we get closer, so that we can make a decision that would see him fully fit at least to start the tournament even if he didn’t play prior to it. One of the things is: we play two weeks prior to the first game. So if we thought he might not be fit for England, but he’d be fit by Canada then… I’m not sure what we’d decide, but that would be part of the decision making process. “That risk management: can we afford to name him and have him not fit, or vice versa? Schmidt prefaces all his thoughts on Healy by citing the role the other members of his coaching staff would have in helping him on the way to the decision. Email “Cian Healy could still make the World Cup squad without playing beforehand”. 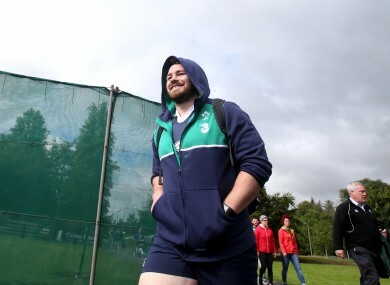 Feedback on “Cian Healy could still make the World Cup squad without playing beforehand”.